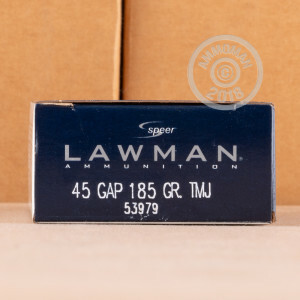 This 45 GAP cartridge from Speer’s Lawman line of ammunition sports a 185 grain projectile, which is 15 grains lighter than what its caliber was originally introduced with. 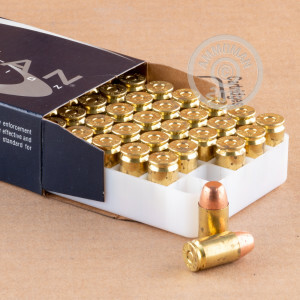 This round’s bullet is ideal for training in indoor ranges where ventilation is less than optimal, as its total metal jacket encapsulates even its base to prevent hot propellant gasses from evaporating the lead in its core. With its 1,060 fps muzzle velocity, this cartridge’s performance is as similar to a personal defense load’s as possible, so training with it is an excellent way to familiarize yourself with your everyday carry or service pistol without having to break the bank for hollow points. 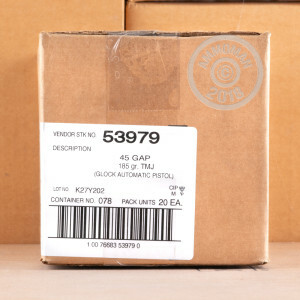 This round additionally offers a non-corrosive Boxer primed factory fresh brass casing, so you’ll have just what you need for some lengthy upcoming reloading projects after you have invested in 1,000 of them.